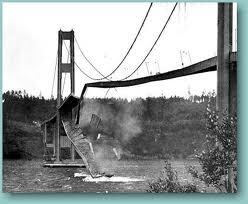 The Tacoma Narrows Bridge collapses due to high winds on this day in 1940.The only fatality was a dog left in a car stranded on the bridge.. The Tacoma Narrows Bridge was built in Washington during the 1930s and opened to traffic on July 1, 1940. It spanned the Puget Sound from Gig Harbor to Tacoma, which is 40 miles south of Seattle. The channel is about a mile wide where the bridge crossed the sound. Sleek and slender, it was the third longest suspension bridge in the world at the time, covering 5,959 feet. Leon Moisseiff designed the bridge to be the most flexible ever constructed. Engineers of the time believed that the design, even though it exceeded ratios of length, depth and width that had previously been standard, was completely safe. Following the collapse, it was revealed that the engineers had not properly considered the aerodynamic forces that were in play at the location during a period of strong winds. 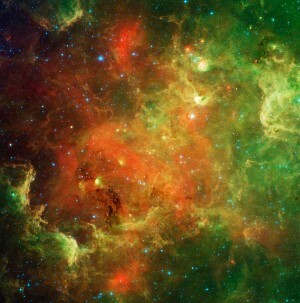 At the time of construction, such forces were not commonly taken into consideration by engineers and designers. On November 7, high winds buffeted the area and the bridge swayed considerably. The first failure came at about 11 a.m., when concrete dropped from the road surface. Just minutes later, a 600-foot section of the bridge broke free. By this time, the bridge was being tossed back and forth wildly. At one time, the elevation of the sidewalk on one side of the bridge was 28 feet above that of the sidewalk on the other side. Even though the bridge towers were made of strong structural carbon steel, the bridge proved no match for the violent movement, and collapsed. Subsequent investigations and testing revealed that the bridge was vulnerable to vibrations generated by wind. When the bridge experienced strong winds from a certain direction, the frequency oscillations built up to such an extent that collapse was inevitable. A replacement bridge opened on October 14, 1950, after more than two years of construction. It is the fifth longest suspension bridge in the United States, 40 feet longer than the original. Construction of the new bridge took into account the lessons learned in the collapse of the Tacoma Narrows Bridge, as did that of all subsequent suspension bridges. Today, the remains of the bridge are still at the bottom of Puget Sound, where they form one of the largest man-made reefs in the world. The spot was placed on the National Register of Historic Places in order to protect it against salvagers. Site contents copyright © 2019 Recorder Online	except as noted. All rights reserved. | 86 queries in 2.466 seconds.